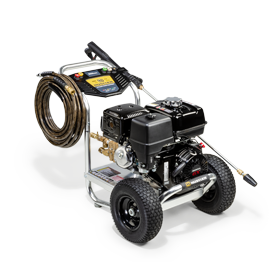 There could be any number of reasons why your lawn mower won't start, but in most cases, it's a simple problem with a simple solution. Before you start worrying about buying a new lawn mower or shelling out for major repairs, look for these common issues. Most lawn mowers have some form of safety start interlock system designed to protect the operator from unintentional engine startup. Usually, the steering control levers must be in the park brake position, and the deck clutch switch must be in the off position to start. Exact positions vary by make and model. Battery issues are some of the most common reasons why a lawn mower won't start. Lawnmowers typically use a 12-Volt battery, and these small batteries tend to wear out more quickly than larger car batteries. If your lawn mower battery is dying, you may notice that the starting motor won't crank, or turns over very slowly. A voltmeter is a great tool to have so you can check your battery's charge. A 12-volt battery should have roughly 12 volts at rest. Learn how to change a lawn mower battery. If your battery is charged but the motor won't crank, check the electrical connections on the battery. The connections may be loose, or there may be corrosion. A visual inspection should let you know if either of these problems is present. Reconnect the wires, or clean up any corrosion that may be present—typically a white or blue powdery material around the terminal. If the engine will not crank, or the starter motor spins but does not crank the engine, the battery could be the culprit, but it could also be the starter. A defective starter relay or solenoid will often cause the mower to fail to start. You can test the starter by using jumper cables to bypass the ignition circuitry. If the engine will not start, starts hard, or fails to keep running, the reason is often that no fuel is reaching the ignition. This may be because there is no gas in the tank—usually there is a fuel gauge that allows you to check the level—or fuel is not getting through. If there's gas in the tank, check the fuel filter and air filter for clogs. A dirty fuel filter prevents enough gas from getting through. A dirty air filter prevents your engine from getting the right mix of gas and air. A faulty spark plug could prevent your engine from getting the spark it needs to ignite the fuel. Spark plugs are accessible and easy to check on most mowers. It's also possible that the engine could become flooded by trying to start it repeatedly. When this happens, the carburetor and ignition chamber become saturated with fuel, and you won't be able to get a spark. When this happens, you must let the fuel drain before trying again. Check out this article to learn more about replacing spark plugs. If you've made it this far and still your lawn mower won't start, it might be time to seek the help of a pro. 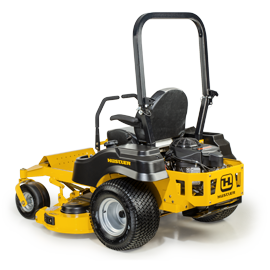 Contact us today to find a local Hustler dealer near you, and together we'll have you back to mowing in no time! Like us on Facebook and Instagram to stay engaged with us! Subscribe to our channel on YouTube /hustlerturfequip.